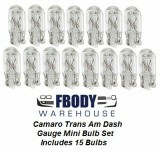 The 1974 - 1975 - 1976 - 1977 Camaro dash lights are easy to replace at home in just a few minutes. We offer LED, 3 watt, or stock 1 watt replacements. 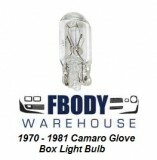 In addition you can buy the bulb retainers and various lighting related parts as well from Fbodywarehouse below.